Illustrated: Picturesque Atlas of Australasia, edited by the Hon. Andrew Garran, 1886, Vol 1, p205. 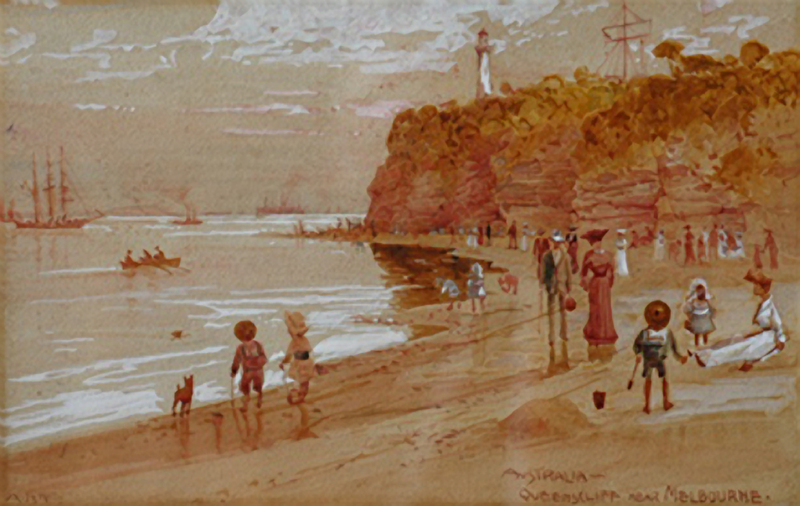 This watercolour was almost certainly used for a postcard by Fullwood titled 'Queenscliff near Melbourne' and published by Raphael Tuck & Sons in their 'Wide-Wide-World' series of 'Oilettes' published c1905-6. This postcard is referred to on page 185 of Picture Postcards of Australia by David Cook, (Pioneer Design Studio, 1986) however, the postcard is not illustrated in the book. Fullwood was born England and studied at the Birmingham School of Art before arriving in Sydney in 1881, at the age of 18, where he was appointed a staff artist on the Picturesque Atlas of Australasia. He exhibited with the Art Society of NSW and later helped establish the NSW Society of Artists in the mid 1890s. He associated with the leading Australian Impressionists at this time and his own impressionist oils, usually painted on panels, are of high quality. He had an extended period overseas from 1900 before returning to Australia in 1920. The image of Queenscliff reproduced in the Picturesque Atlas of Australasia varies from the Fullwood watercolour. Indeed, the Atlas image bears the signature of Fred B. Schell who was an American employed as senior illustrator on the Atlas. Schell had arrived in Sydney with two other Yankee illustrators, W.T. Smedley and W. C. Fitler. This suggests that Schell produced another version of Fullwood’s watercolour or that the engraver mistakenly believed Fullwood’s original to be by Schell. Or Fullwood may have submitted another, unsigned, version of the scene for reproduction and kept this one inscribed ‘Australia’ for himself. There is at least one other watercolour and gouache painting by Fullwood which is inscribed ‘Australia’. This is Australia - Jenolan Caves, the Devil's Coachhouse, NSW and it appears to be the illustration for the work of this title which is also produced in the Picturesque Atlas of Australasia. It sold at Sotheby's Australia, Sydney, 24/08/2004. Another beach watercolour by Fullwood titled Bronte near Sydney and which is very similar to Queenscliff near Melbourne, was in the Cowlishaw sale in 1984 and sold for $7500. It was reoffered in 1988 and sold for $15,000. “(It) is too spacious to be picturesque; it is one of those cases in which distance does not lend enchantment to the view, for it is only nearer to the shore line that its more attractive characteristics disclose themselves, and these have to be sought out with a certain amount of enthusiastic diligence. Queenscliff, however, has undergone a remarkable transformation. Its breezy heights are now surmounted by the mansard roofs and tall turrets of three or four roomy and commodious hotels, and a large town has taken the place of the scattered village which formerly straggled over the surface of Shortland’s Bluff-as it was called in the early days. The fortifications, which have been constructed on this side of the heads, as well as on the opposite point and upon certain islands and shoals adjacent, have rendered the place additionally interesting by investing it with a strategic importance in relation to the defences of the Victorian capital. They consist of batteries at Queenscliff, Point Nepean, Swan Island, Point Franklin and the shoals in mid-channel an these form the first line of defence. They have been furnished with ordnance in conformity with a plan suggested by Sir William Jervois, and much of -the work was carried out under the personal direction of the late Sir P. H. Scratchley. "